A pretty, decorative bedroom fireplace with a Victorian cast iron insert and a Victorian reclaimed pine fire surround. The fireplace is petite, perfect for a bedroom and has a lovely, subtle twist design. The cast iron insert has a decorative leaf motif on the top plate. One front bar has a crack and the bottom front bar is missing. One back leg is missing but the insert is stable. The reverse has a diamond registration mark dating the fireplace to 3rd July 1874. The cast iron has been blacked and polished. There is a large crack at the top of the insert but is mostly hidden by the surround and does not affect the stability of the insert. 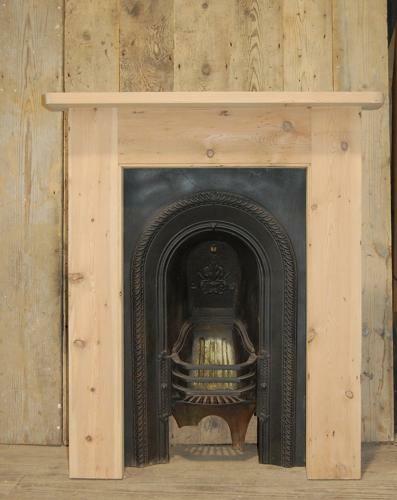 The fire surround has been made from reclaimed Victorian pine. The pine is solid and in good condition, framing the iron insert nicely. The pine has been stained and could be waxed or painted by purchaser. Fixing plates will be supplied and is easily fixed to a wall. A lovely item that would make a very nice feature in a bedroom. Please note this is a decorative item only and not suitable for use.